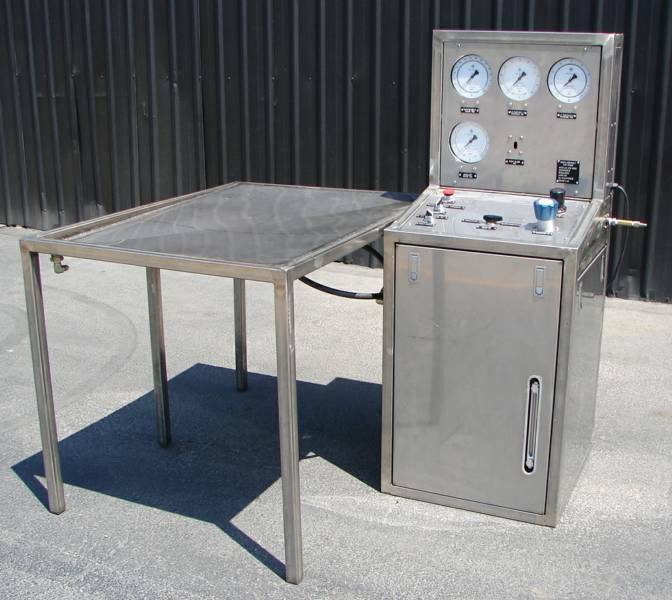 The DK Aerospace & Industrial Brake Assembly Test Stand is designed to provide a source of hydraulic fluid for flushing, cycle testing, leak testing and static testing a wide variety of hydraulic brake systems. A low pressure, high flow system is used for flushing the brakes assemblies. A high pressure, low flow system is used for static testing, leak testing and cycle testing of the brake assemblies. The Brake Assembly Test Stand enclosure in constructed entirely of stainless steel, and the doors and removable panels provide for ease of maintenance. Large, easy to read instruments and controls provide for ease of operation, and the sink assembly provides for mounting of the brake assemblies. It is equipped with inlet connections, return connections, and air hose assembly. Any spilled fluids are drained into an easy to service drain canister. The operator is protected from fluid leaks during the testing process by a glass partition. The Brake Assembly Test Stand can control cycle testing automatically with the optional PLC upgrade package. The Brake Assembly Test Stand Model 5-HTS-50BA is proudly Made in the U.S.A.